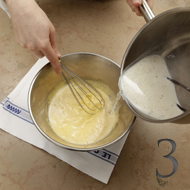 Le Cordon Bleu explains the crème anglaise technique, step by step, with this basic recipe that can be used in all situations. Return the mixture to the saucepan. 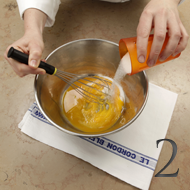 Cook over low heat, stirring constantly with a spatula until the mixture thickens and coats the spatula. (Do not boil). Raise the spatula out of the saucepan and hold it at an angle. It should be covered crème anglaise. 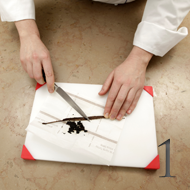 With one finger, trace a horizontal line on the spatula. You should be able to get a clean separation of the crème anglaise which does not run back together. Strain the crème anglaise through a china cap sieve into a clean bowl which should be sitting in a second, larger bowl containing ice. Stir the crème anglaise regularly until cool. This technique will enable you to fill éclairs, religieuses or other choux pastries neatly and with ease! Le Cordon Bleu shows you how to make sweet shortcrust pastry with a recipe that can be used for making any tart or tartlet.